The City of Mt. 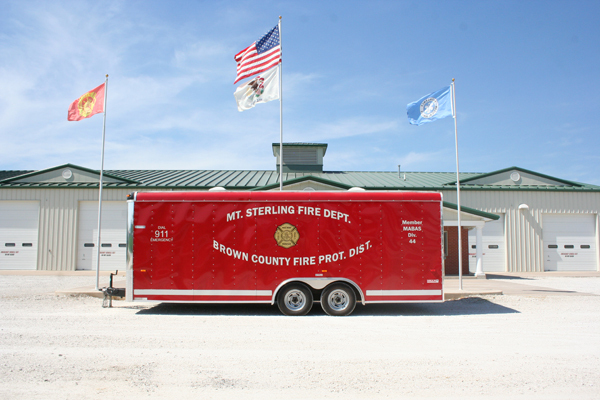 Sterling and the County of Brown began a collaborative effort in 1999 to construct a new station that would house the MSFD, BCFPD and the Brown County Ambulance Service (BCAS). A three acre site on the West edge of Mt. Sterling was purchased in 1999 with a $100,000 grant from the State of Illinois as a site to construct this new station. In late 2002, the State of Illinois awarded a $350,000 Illinois First Grant to the city and county to begin construction of this new facility. With those funds, construction of the shell of the building began and was completed in late 2003. With no additional funding at that point, construction halted and the building sat vacant until 2005 when the county received additional grant funding as a result of the sale of the Buckhorn Ranch to the State of Illinois. With that funding, electrical and plumbing work commenced and was completed by early 2006. Again, with no additional funding, the construction halted and the building again sat dormant. 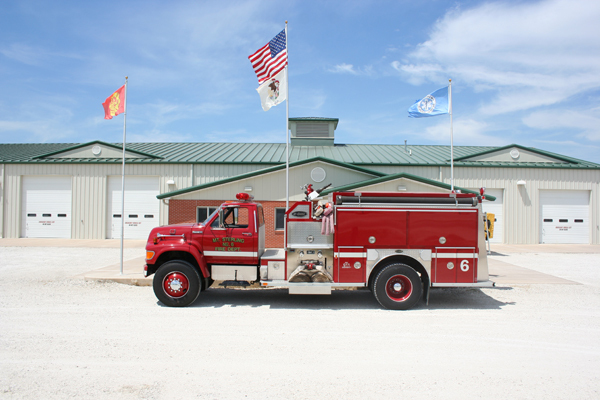 In the fall of 2007, a local group of concerned individuals spearheaded an effort to help the local fire and ambulance personnel raise the needed funding to complete the station. Those efforts raised approximately $100,000 which was enough to have all of the concrete work in the building completed in the spring of 2008. Following the completion of the concrete work, the only remaining work to be done was the construction of the finished interior office and living quarters. 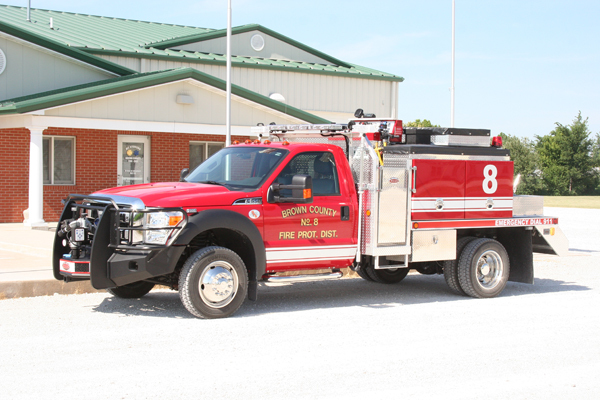 A $100,000 loan was obtained by the county to complete this work and has since been paid off completely with funds raised by the fire and ambulance personnel. Finally, in October of 2009, all three departments moved into our new home. 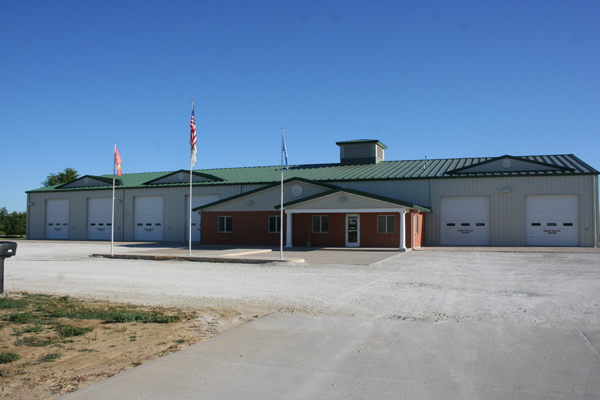 This facility is 15,000 square feet (5,000 square feet office and living area & 10,000 square feet apparatus floor and storage) and replaces a 3,500 square foot fire station and a 2,000 square foot ambulance station. The building was designed with the office area and living quarters in the middle of the station separating the fire department side from the ambulance side. The heating and cooling system is geo-thermal which has drastically reduced the utility expenses from what they were at the old facilities. The office area and living quarters boasts administrative and secretarial offices, sleeping rooms for the on-duty ambulance personnel whom work 24 hour shifts, shower and locker room facilities, laundry facilities, a large commercial kitchen and a training room that will accomodate 50 people. The decision was made to build a large kitchen due to the fact that we hold numerous fund-raisers throughout the year which typically involve preparing and serving food. We have designated the station as an emergency shelter for the residents and visitors of our community. Back-up power for the building is available from an 85kw diesel generator which completely powers the building (including heat and air conditioning) in the event of a power outage. This is a benefit of huge proportions as we would have the ability to house several hundred individuals should the need ever arise. Inaddition to serving as an emergency shelter, this building serves as the Emergency Operations Center (EOC) for Brown County. The EOC is where local officials gather during large scale events for mitigation and decision making purposes. Precision Tank & Equipment 2,500 gallon tank with four 2 1/2″ inlets, two 10″ quick dumps and fold down drop tank holder. It is a 1993 Ford F-350 4×4 brush truck built by Alexis. 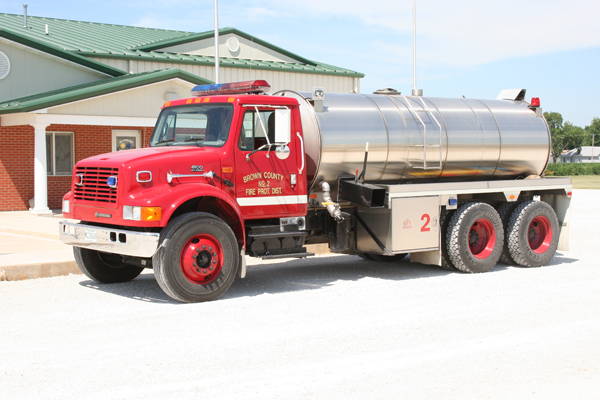 It has a 500 GPM Barton – American front mount pump and carries 250 gallons of water. 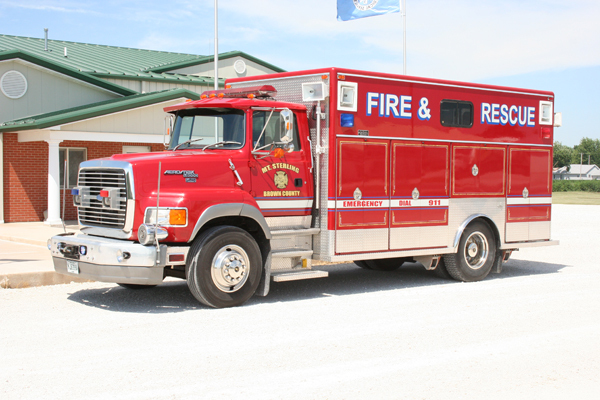 We use this truck as a light Rescue Truck so it carries minimal Rescue equipment for auto extrication. It also carries misc. hose, nozzles and fittings. This truck is stationed at the firehouse in Timewell, six miles west of Mt. Sterling. 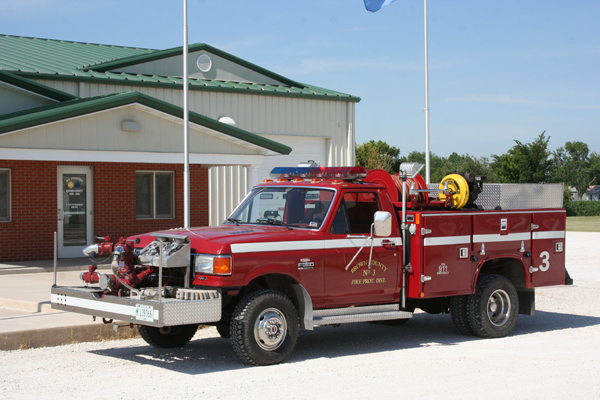 A 1994 Ford F-800 pumper built by E-One. It has a 1,250 GPM Hale pump and carries 1,000 gallons of water. It carries 1,200 feet of 3″ hose as well as two 1 3/4″ pre-connect attack lines. It also carries 4 Self Contained Breathing Apparatus (SCBA’s) with 4 spare cylinders, , misc. hand tools, misc, nozzles and fittings, foam equipment, 35′ ground ladder, 14′ roof ladder and 12′ attic ladder. 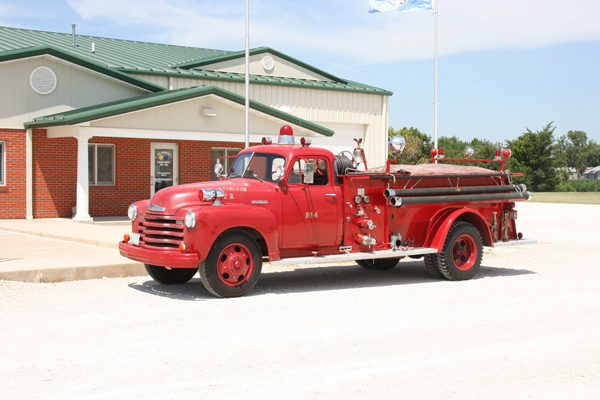 A 1952 Chevrolet pumper with an In-Line V-6 engine. It has a 500 GPM mid-ship pump and carries 500 gallons of water. The fire truck was built by General Corporation which has been out of business for many years. We still use and certify this truck every year and it is still considered to be a reserve engine. It carries 1,200 feet of 2 1/2″ hose, 400′ of 1 1/2″ hose and misc. nozzles and fittings. A 1974 Ford F-750 pumper. It was built by the John Bean Corporation and has a 750 GPM Waterous mid-ship pump, a Bean High Pressure Pump and carries 750 gallons of water. This engine carries 600 feet of 5″ large diameter hose (LDH), 1,200 feet of 2 1/2″ hose and two 1 1/2″ attack lines. It carries two SCBA with spare cylinders, misc. nozzles and fittings, foam equipment, one 35′ ground ladder, one 14′ roof ladder, one 12′ attic ladder and misc. hand tools. This engine is the city’s second out engine for any call within the city limits. 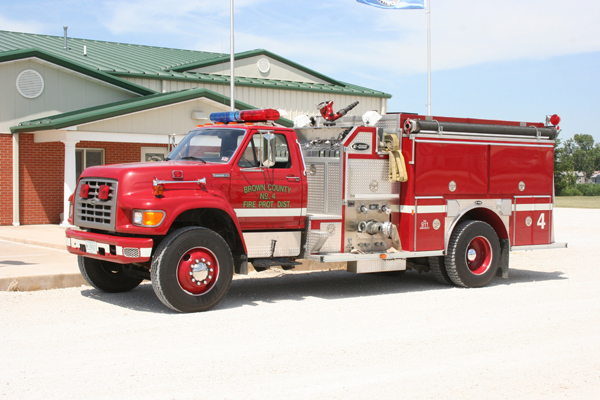 A 1994 Ford F-800 pumper built by E-One. It has a 1,250 GPM Hale pump and carries 1,000 gallons of water. It carries 1,200 feet of 3″ hose as well as two 1 3/4″ pre-connect attack lines. It also carries 4 Self Contained Breathing Apparatus (SCBA’s) with 4 spare cylinders, misc. hand tools, misc. nozzles and fittings, foam equipment, 24′ ground ladder, 14′ roof ladder and a 12′ attic ladder. This engine is the city’s first out engine for any structure fire within the city limits. 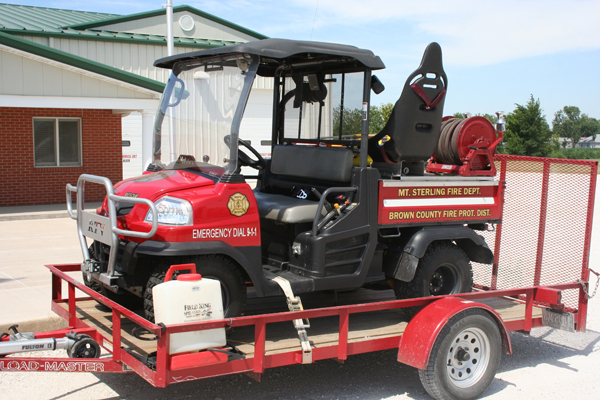 This brush truck was purchased new in September of 2011 by the Brown County Fire Protection District. It is a 2011 Ford F-550 4×4 chasis with a Weis Fire & Safety brush truck body. It has a 375 GPM Hale pump and carries 450 gallons of water. It has a Compressed Air Foam System (CAFS) with a 20 gallon foam tank. It has a Task Force Tips remote control nozzle mounted on the front bumper which can be controlled from inside of the cab while the apparatus is in motion. This truck carries a Hurst hydraulic cutter, spreader and ram for auto extrication along with cribbing. It also carries misc. hand tools and hose and nozzles. This apparatus is the first out piece of equipment for any brush fire, auto accident or airport emergency at the Robert F. Tracy (Mt. Sterling) Municipal Airport. This All Terrain Vehicle and Trailer were puchased in 2005 with a 50% grant from the Illinois Department of Natural Resources and 50% grant from the United Way of Brown County. The ATV is a 2005 Kubota RTV 900 with a diesel engine. We designed a brush unit with a place for a stretcher and had Precision Tank & Equipment construct it for us. 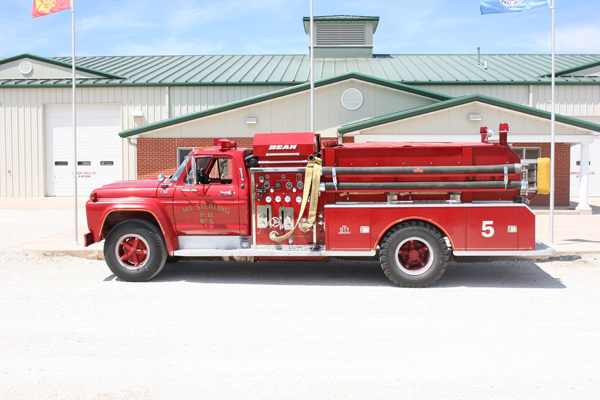 The unit carries 81 gallons of water and has a 100′ hose reel with a 5 GPM hydraulic pump. We also carry misc. tools for fighting brush fires. We have the capability with this unit to carry a patient in a stokes basket and also have a jump seat where a paramedic can accompany the patient. This unit is extremely beneficial due to the large number of brush fires and injured hunters that we respond to each year. The boat on the left was donated to the Mt. Sterling Fire Department by the family of James (Butch) Busen who lost his life in Vietnam, October 6, 1969. It is a 14′ Marine & IND boat with a 9.9 horsepower Evenrude motor. 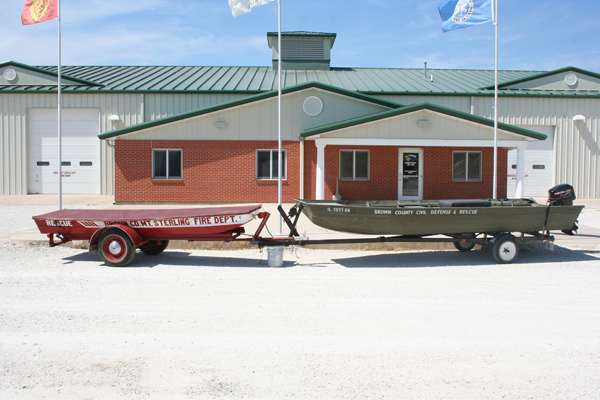 The boat on the right belongs to the Brown County Emergency Services & Disaster Agency (ESDA), formerly known as Brown County Civil Defense. It is an 18′ Polorcraft boat with a 25 horsepower Mercury motor. Brown County is bordered on the East side by the Illinois River and we also have numerous ponds and lakes throughout the county. The Mt. Sterling Fire Department & Brown County Fire Protection District are often called for emergencies on the various bodies of water. The firefighters of the Mt. Sterling Fire Department & the Brown County Fire Protection District are trained to various levels of Hazardous Materials response. We have personnel trained to the Hazardous Materials Awareness, Operations, Technician and Incident Command levels. This trailer carries a vast amount of supplies needed for a response to a Hazardous Materials incident. Some of the supplies include: absorbent materials (floor dry, socks, pillows, etc. ), a large amount of foam concentrate, decontamination equipment (portable showers & supplies), class A & B level suits. The Mt. Sterling Fire Department & Brown County Fire Protection are members of MABAS Division 44. 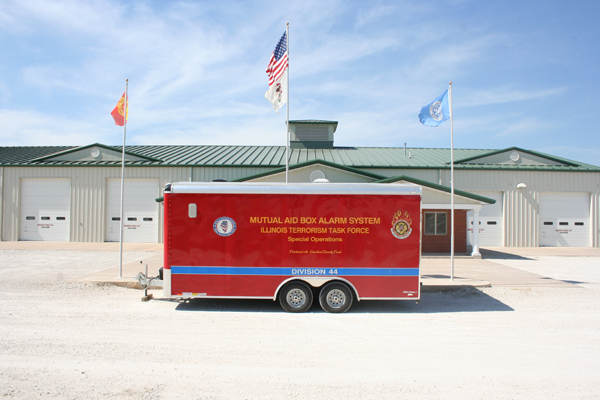 MABAS stands for Mutual Aid Box Alarm System and is a statewide system that organizes mutual aid response from fire and Emergency Medical Service agencies. This trailer contains a large tent and supportive equipment that can be used in the event of a large deployment of emergency responders. There are a large amount of these tents strategically located around the state of Illinois and can be connected together in the event of a disaster to serve as temporary housing for displaced residents. The tent comes with a heater/air conditioner combo unit and has been used by our department each year at the Brown County Fair to serve as a cooling center. 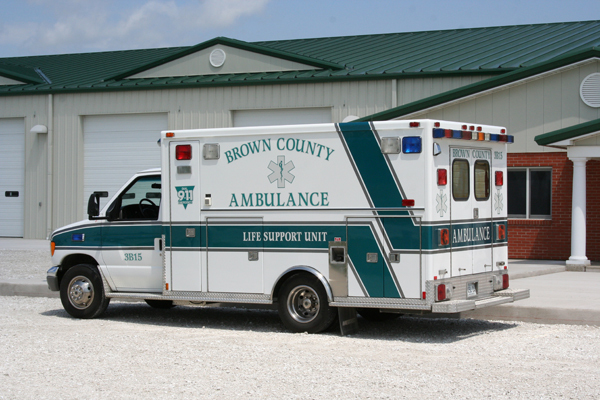 This unit is one of two Paramedic Unit’s operated by the Brown County Ambulance Service. 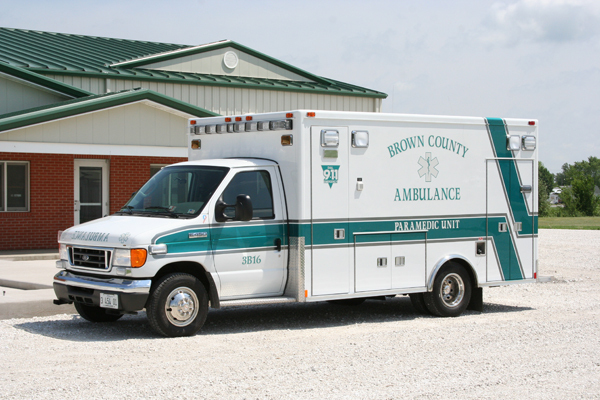 It is a 2006 Ford E-450 with a Med-Tec Ambulance Conversion. Both of our Paramedic Unit’s have 12-lead EKG capability with the ability to transmit the EKG to the closest Cardiac Center in Quincy, IL. This is our oldest ambulance still in service and serves as a Basic Life Support Unit (BLS). It is a 1986 Ford E-350 with a Med-Tec Ambulance Conversion. Basic Life Support Unit (BLS). It is a 2000 Ford E-350 with a Med-Tec Ambulance Conversion. Paramedic or Adavanced Life Support (ALS) Unit. It is a 2000 Ford E-450 with a Med-Tec Ambulance Conversion. 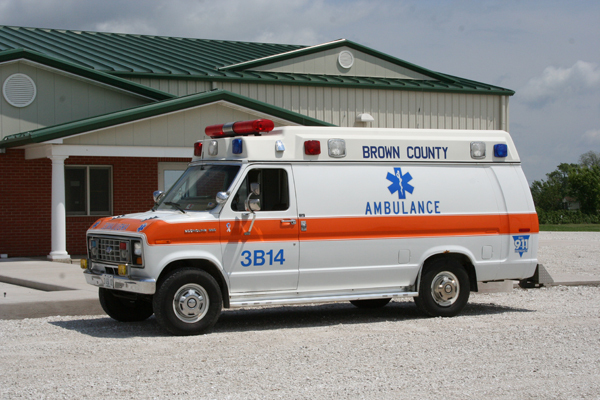 An interesting tidbit of information is that prior to 1994, all of our ambulances had the orange and white color scheme like in the earlier picture that I had sent you. At that time, the Illinois Dept. of Public Health required that ambulances use that color scheme. 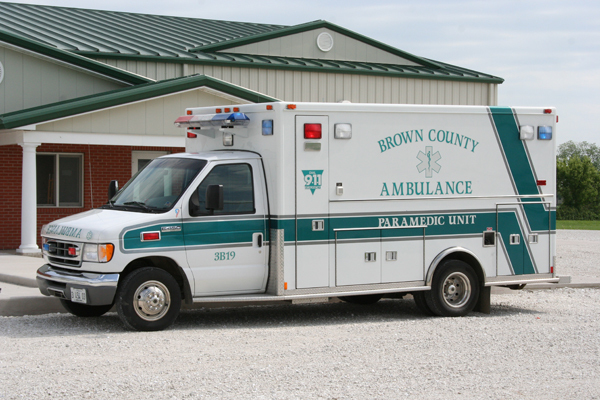 By 1994, we had ordered a new ambulance (which we no longer have) and since the requirement from IDPH regulating the color scheme had been lifted, we decided to change our color scheme to the green and white in support of the Brown County Hornets.